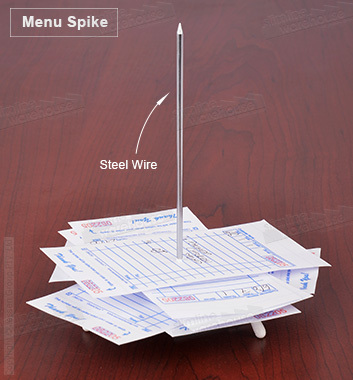 This receipt spike, also known as a wire bill spindle, is 152mm high to be seen by cooks and waitstaff at your restaurant without taking up heaps of space. The base of the stand has rubber stoppers that help prevent scratches to different surfaces during use. Chrome plated wire is used to provide a rust resistant, durable stand that will last for years to come. The receipt spike has a sharp end that easily penetrates paper to hold them in place during and after a service. The memo holders are typically used by cooks to put orders after they have been brought out to customers. Keeping all the bills in one place makes it easy for cooks, managers, and waitstaff to check discrepancies with orders and add up how many visitors have been to the restaurant during a period.